Located on spectacular Waimanalo Beach, this elegant home features designer furnishings, a spacious ocean front backyard and a large tropical front yard with a tropical lily pond, waterfall and gardens. The kitchen, living room, dining room and two of the bedrooms all have fabulous ocean views. The master suite occupies the entire second floor, and has a private patio with spectacular views of both the ocean and mountains from the bed. Leading into the master suite is a lounge area with sweeping views of the Koolau mountain range, perfect as a place to relax with the book and watch as the sun sets over the mountains, or to use as an additional sleeping area as there are two twin day beds. There is a second master suite downstairs off the tropical garden, where we have installed a large new jacuzzi hot tub. The mattresses are the same brand used in 5 star hotels, including the Waldorf Astoria. The pillows are luxurious, hypo- allergenic faux-down variety. 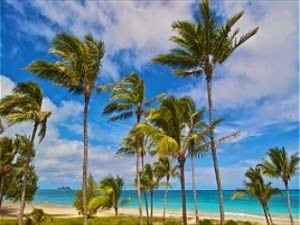 Hawaiian Islands Beach Vacation Rentals, Homes, Condos, Houses . . .